Islamorada Fish Company is part of the fabric of what makes up the Florida Keys, and has quite a history, as it has over the years grown from the one shack operation which it originally started at, through to the kind of business that you can see across the whole of America. So we will start about some regional information about the Islamorada fish company, such as its location, what it sells, and then if you are still interested we will add a piece on the history at the bottom of the page. So let’s get down to business, with where the Islamorada Fish Company can be located? This is a very good question because as you have driven around America you will have seen a few of these restaurants scattered around, as it has done very good business and expanded alot, but the original Islamorada Fish Company and some might say the best is to be found in Islamorada.....funny that. If you are looking for the place then follow the Mile Markers that run down through the Florida Keys. These are the little green signs on the side of the road. They run from 126 up in Florida City on the mainland of Florida, down to the iconic Mile Marker 0 which is to be found right at the bottom near the southernmost point in Key West. Or the other way you can get to the Islamorada Fish Company is by boat if you have one. Which is a lovely way to go out for dinner I'm sure you'll agree. However please be aware that the water around here is very shallow indeed, so you won't be able to moor right outside, but if you have a small boat you can anchor off the Lorelei and dinghy over. Best bet just steer the boat down and look for the crowds...it's quite popular after all. What Does It Sell Is It Just Fish? Well of course with a name such as the Islamorada Fish Company you would expect to see fish on the menu, but there is quite a bit more to their menu.....ever tried alligator? Yep, with alligator on the menu you just know that the standard menu fillers like steak, salads, snadwiches, ribs, chicken and the like are all here too. What Is The Decor And Seating Arrangements Like? If you go to the back of the restaurant where the dock is you will find some seating with a thatched roof giving it a kind of tropical feel. This is a lovely place to sit, as you get the perfect view of the sunset, whilst refreshing breezes float around. Inside the restaurant it is more what you would expect with the emphasis on the decorations being of fish and stuff. I always try to sit outside if I can, as you can always sit indoors wherever you go really. Do something different, you're on vacation after all. Is There Anything Else About The Islamorada Fish Company That Is Worth Visiting For? The location is quite spectacular, with a position by the ocean which is about as good as you can get to savour the sunsets that are world famous in the Florida Keys. Also of course being down on the water you will have a lovely position to see the boats bobbing around at the docks. 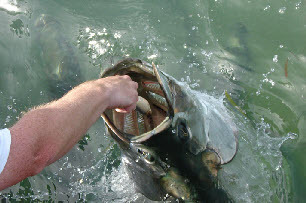 And don't forget the tarpon feeding, which the kids will love. Around about sunset you can move over to the bridge, and watch the silver kings of the water being fed, and literally flying out of the water to grab hold of whatever treats are on offer. Perhaps the more famous exponents of this practice is over at Robbies Marina in Islamorada, who actually have a restaurant call the Hungry Tarpon too. You might as well publicise this activity as much as possible I suppose. What Is The History Of How The Fish Company Began? The Company was first started as a family business back in 1948, purely delivering the finest and freshest fish from the Florida Keys waters. This was a hit and soon the family were selling their fish to not just Islamorada locals, but also to the restaurants in the areas. Things pretty much stayed the same way until in 1981 after a rumored game of cards, the Hertel family took over (or won dependent on your view of history) the restaurant and started shipping fish. whilst also serving food in the market. At first it was serving family recipes that had served them proud, and then they chucked in some other stuff too, all sold from down in the retail market. Not in a million years did they consider making it into a restaurant as back then it just wasn't on their radar. But then as legend has it someone brought to work a deep fish fryer, and the local fisherman loved the fried snacks that they were able to serve up, so they laid out a couple of picnic tables, grabbed some chairs and started their little cottage industry. And it wasn't really until 1993 that things started moving on a pace to the restaurant and market that we think of today. Since then such has been the expansion that the Bass Pro Shops bought in with the owners, and now you can sit and have a meal at the Islamorada Fish company in 24 locations across the states.